It’s time to get new haircuts now! 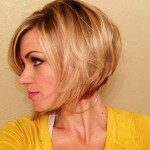 If you wear longer hair, then here is a cool trendy style for you to choose from. Here’s another view of Adam Levine with longer hair that produces more height on top and a touch of volume at the sides. The top is styled back in carefully-defined strands that are curved at the ends to give lots of movement and interesting texture to a very attractive look! Find more Adam’s hairstyles here and find more new 2014 hairstyles for men here.